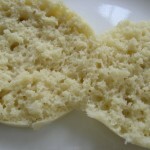 If you’re looking for a delicious and low carb breakfast bread, why not try these English Muffins? In a large bowl, mix the first 7 ingredients together. 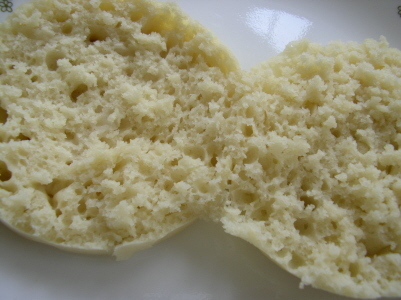 After mixing, the dough is expected to be moist, this is normal. Next combine the final three ingredients, and add to mixture. Divide mixture to desired muffin size and shape. For uniform muffins, use English Muffin Rings. Allow to rise in a warm place until double in size. Place into a slightly oiled fry pan and fry on low heat until done about 10 minutes each side. Cool slightly, and remove rings (if used). How many carbs per muffin would you say they are?? Thank you for your question. The nutritional statement and serving size for our products are for the mix only, and not for the finished product. Some of our products have a 2nd line indicating how much the serving size makes into a finished product once you add your wet ingredients and prepare the product by the instructions. The ingredients that you add should be adding mostly only fat and protein to your mix, and not significant carbohydrates, that is what are products are all about. We cannot predict the nutritional values of a customer’s added ingredients that they purchase, because for example all heavy cream or sour cream are not created equal. You want to choose these products with the least amount of milk sugar added and read your labels. There is sour cream for example made purely from cultured cream and others that are part cultured cream and part milk product, and even some with added sugar. Whether milk is skim or whole it usually contains the same sugar/lactose/carbohydrates in it. In the same way for example heavy cream or whipping cream can be pure cream which is without sugar/lactose/carbohydrates and others made more like a half and half adding milk of some kind. The dairy producer does this to save money, because to most consumers as long is it whips up into cream they are happy. Another example in variances is eggs. Twenty years ago an egg in a carton labeled “large” today look like a small egg if you notice, and there is a big difference in protein and fat between a small egg and a real honest to goodness large egg. So you will need to add in the nutritionals’ for your added ingredients, and divide by your number of serving per the package. Thank you for writing to us about this. I hope this helps you.